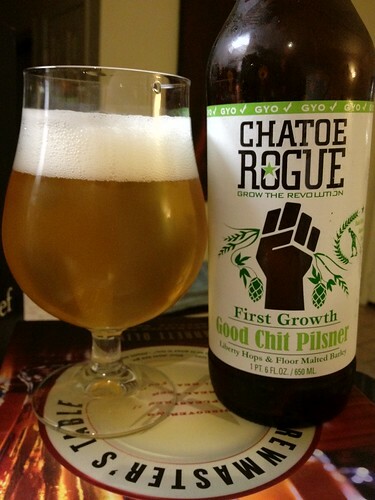 Chatoe Rogue Good Chit Pilsner, originally uploaded by adambarhan. A: A straw color with a slight chill haze and a finger’s width white head that laces the glass. S: Bready malt with a fresh earthy, grassy hop aroma. T: The hop is immediately noticeable with a floral and earthy flavor that overpowers the malt. There is a very slight bready malt flavor and a slight sweetness. It finishes clean with a slight floral hop. M: Light with good carbonation. Very refreshing. O: I like the aroma and flavor of this beer. Pilsners aren’t my favorite style but this is nice.